Looking to give extra push to your business. Integrate social activity to your website. Social activity sites like Facebook, Twitter, Pinterest etc have become an important part of our life. If you are thinking of making community website. Then Buddypress allows you to do that. Your social website is ready without any help from coders. Using Buddypress WordPress themes are powerful socializing platforms. Visitors are engaged and informed. Reviews and comments are integrated. These themes are responsive, loaded with lots of features. And offer lot of customization. Easy and user friendly themes makes your website visitor friendly. Most important of all is that your approach is more social and friendly. Here is the best collection of these themes. UnitedCommunity is premium buddypress wordpress theme. The layout is liquid which adapts well in most modern mobiles and laptops. The design is eyecatching, colorful and modern. rtMedia is integrated in the theme. This feature allows members to easily upload music/videos/images. Easy to make groups, forums or user panels as it contains lot of inner pages. There are 40+ inner pages – pages for registration, group forum, member’s profile, blog page etc. Remove, move or delete any widgets on the front page. The theme is compatible with lots of BuddyPress extensions – adding chats, calendar for events etc. You can also set up your ecommerce shop as this theme is compatible with WooCommerce. Customize the widgets. Translation ready. This theme has all the features required to run a comprehensive community website. GONE is a responsive buddypress wordpress theme. It is a neat, clean and smart looking theme. The theme is compatible with WooCommerce and bbPress. WPML ready which helps you in making a multilingual community site. Includes free addons – Visual Composer and Slider Revolution. It has 7 homepage variations, 3 blog layouts, 3 portfolio layouts, image backgrounds, shortcodes, google fonts, mega menu and much more. You can customize the page layouts, change colors, have unique page logos etc. 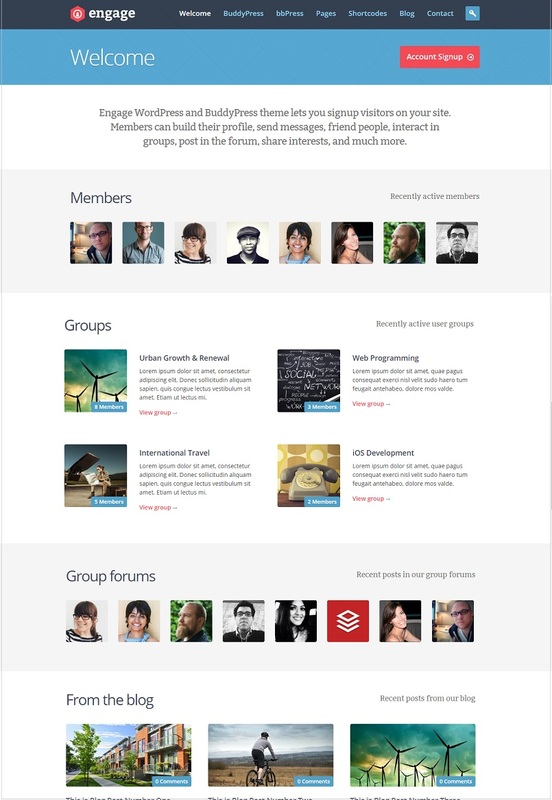 Member logins, make groups, discussions, add forums etc make it a well thought buddypress theme. SocialChef is a perfect wordpress theme to start a food social community. The theme is responsive as it adapts well to various screen sizes from mobiles, laptops, tablets and desktops. The design is clean , beautiful and modern. SEO optimized theme with schema.org compatibility. One can submit recipes or other information from front end. It has advance search support. WPML ready make your website translation ready. WooCommerce compatible. BuddyPress and bbPress is integrated. You can customize page layouts. There are 12 color options, more than 1500 font options, and much more. Member activities, member submissions, feeds, profiles, comments etc as included as community features. Kleo is a responsive multipurpose wordpress theme. Besides using it for community website you can use this theme for seting up an online shop – ecommerce,professional blog, portfolio website, agency website, business website, online learning site, woocommerce website, news magazine site, business directory etc. There are 21 home page layouts to suit your business. This theme is extremely flexible. Using Live Wp customizer you can change colors, fonts, layouts, add unlimited sidebars , change views etc. Build with HTML5 and CSS3 coding. Powered by Bootstrap and jQuery. WPML ready allows you to create multilingual website. Login via facebook. Contains over 40 page to create an awesome buddypress website- Memberships can be created, groups can be created, logins, create forums, blogs etc. Drag and drop builder allows you to add/delete elements to create unique pages. Pricing table elements can easily be added via visual composer. Various styling options by using themes options panel. Headers, footers, socket sections etc can be customized. Compatible with many plugins like Geodirectory, Sensei e learning plugin, rtMedia, Contact form 7 etc. Live Ajax buddypress notification adds notification to menu. Ajax search shortcode helps in customizing searches. Free addons worth $70 as plugins – Go Pricing, Revolution slider, Visual composer. Free lifetime updates. Kleo includes awesome buddypress shortcodes, + 700 fontello icons, 3 blog layouts, one page function, various post formats and much more. The options, design, styling features are endless. This premium template costs $64 which is cheap considering so many options and features. Below is the screenshot of one of the demos. 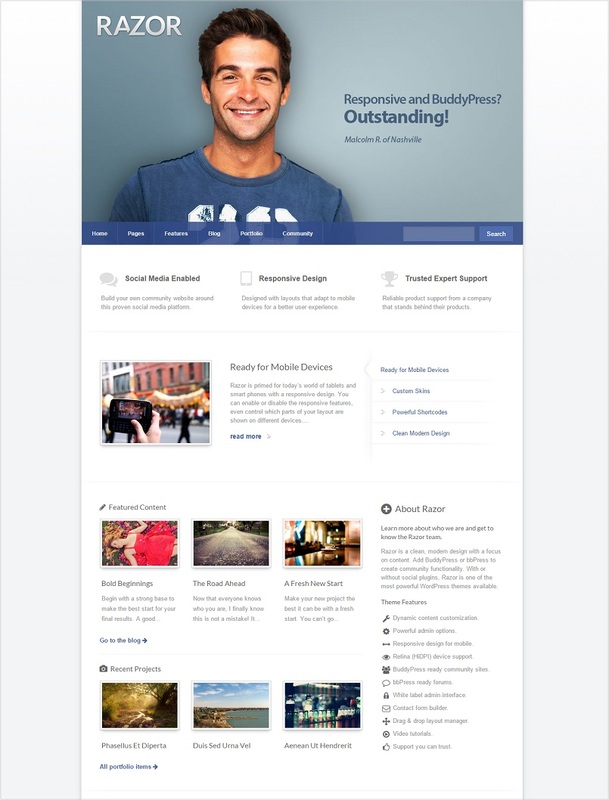 Woffice is a Extranet/Intranet WordPress theme. The theme is multipurpose as it can be used for community networks, school networks or any extranet/intranet business/government networks. The theme is clean and modern. Build with latest HTML5 and CSS3 coding. Woffice is responsive and retina ready themes. It is compatible across various browsers. WPML ready makes your website translation ready. Woffice makes an awesome complete buddypress network- Members directory, detailed member profile, make groups, messaging, user maps,customized logins, manage projects, add calendars, forums plus add lot more in community website. The theme is fully customizable with unlimited colors, unlimited fonts, unlimited sidebars,page options, add widget in footers, over 600 icons with menus, favicon /logo managment etc. Projects can easily be managed with option of front end editing, time progress bar, file manager etc. bbPress and WooCommerce are integrated in the theme. Logins support facebook and google logins. Websites can be made private. Woffice is perfect for any kind of application. Sweet Date is a responsive wordpress theme. The theme ideal to start a community site and a dating site. Retina ready. Compatible with major browsers. WPML ready which makes this theme translation friendly. HTML5 and Css3 coding has been used. Sweet Date is integrated with major payment gateways- PayPal, Authorize.net, Stripe etc. It includes customizable membership plugin. Supports member registration and logins via Facebook. BuddyPress & bbPress is integrated. Quick and easy to navigate user profiles. Profiles can be customized. Notifications like friend request , new messages are added in profile buttons. Shows online status of registered users via green icons. It has ajax instant search which shows the search while your are typing in the search box. rtMedia ready which allows users to upload images, videos etc through front end. Sweet Date is a WooCommerce ready theme which allows you to sell any type of product. It has powerful admin panel which allows you to customize the theme. You can change layouts, colors, typography etc. Customized page can easily be build using custom visual shortcodes. Revolution slider adds amazing slider with effects. The theme has unlimited color options and 3 color skins – mat style, transparent and car sharing . You can have a boxed/wide version. MailChimp is integrated to send awesome newsletters. Google maps are integrated. It has over 600 google fonts, 40+ inner pages for your community site, Layered PSD files, unlimited sidebars and much more. Cinematix is a responsive wordpress theme. You can use theme for your social activity site as this integrated with BuddyPress and bbPress. Ideal theme for corporates, schools/universities, fashion, sports etc communities. Members can make their profiles, send messages, upload photos/videos, start discussions etc. There are more than 40 inner pages to make a comprehensive community website. It works well with over 100 BuddyPress extensions. It has 10 color options, wider layout, metro layout homepage option, shortcodes etc. Cinematrix is built with latest HTML5 and CSS3 coding. Compatible with major modern browsers. CommunityJunction is a premium responsive buddypress wordpress theme. The theme can be used to make social community website for company, schools/colleges, fashion, sports, arts or any other niche community. CommunityJunction has an awesome wide layout. It has 40 + inner pages to make an impressive community website-Member login page, Member activity page, Group forum page, sent invites etc. It supports 100+ buddypress extensions like music managers, user galleries, social articles etc. The theme has a live chat. Being compatible with WooCommerce also allows you to sell products. It is a complete package for a community website. Flix is a responsive premium wordpress theme. The theme is suitable for setting up a community website and blogging. The theme supports Buddypress and bbPress. It has a shortcodes builder to make customized buttons, tabs etc. The theme coding is light and clean. It loads faster on all major browsers in mobiles, tablets, desktops and laptops. MailChimp is integrated to send smart newsletters. Easy to customize the homepage. White label enabled creates custom logos , colors, images and themes. The theme is ideal for those who want blogging combined with social activity. Razor is a responsive wordpress theme. The design is clean, modern and professional. Use this theme for a community website, social network, blogging , portfolio etc. Retina ready as theme has HiDPI graphics. BuddyPress and bbPress is integrated. You can have unlimited colors, sidebars, layouts, templates and home page options. Headers, Footers, layouts can be customized using powerful admin options. 10 homepage skin options. Drag and drop feature helps in customizing layouts. Plenty of shortcodes to jazz up your website – buttons, tags, icons, tabs, contact forms etc. Plenty of blogging options. Easy to add slides anywhere in the page. Member directories can be made, sign in, groups can be viewed and much more to make a perfect community website. OneCommunity is an responsive wordpress theme. The theme is fully integrated with buddypress plugin. This makes it an awesome theme to use it for a community site, social network site for school, colleges, companies, sport teams or any other groups. The design is colorful, modern, informative with a wide layout. Looks like a magazine style theme. Built with latest HTML5 & CSS3 coding. Compatible with major browsers. Supports WooCommerce, this makes easy for you to sell online. It is integrated with bbPress to start forums. Includes free addons worth $21- Ajax search Pro, OneByOne slider. OneCommunity has 9 color options, 4 home page layouts options, 3 level drop down menu, 15 PSD files and +40 inner pages. The inner pages are- Login Page, Group Activity Page, Member Profile page, Member Notice page etc. These inner pages will make a great looking community website. What I liked most is its awesome page designs that is simply WOW. Hope you will enjoy seeing the demo. Plexus is a responsive wordpress theme. It is a good theme for blogs and community sites. You can host even both blogs as community website in one site as this a multisite theme. BuddyPress is fully integrated in the theme. It is build with HTML5 and CSS3 coding. Retina ready. WPML ready makes your website multilingual. bbPress is also integrated. It has free addons worth $40- Layer Slider and visual composer. Visual composer helps you in building customized pages and layouts. SEO optimized theme ensures good ranking of your website in search engine. You can change colors, fonts and layouts by using skin manager. The theme is compatible across all major browsers. This premium theme costs $59. All I can say is that you final website will look clean and modern on installing this theme. 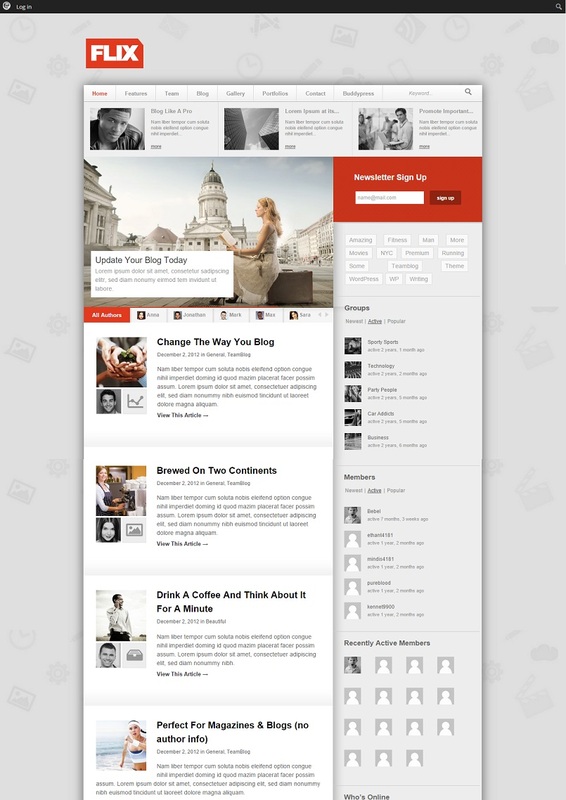 Socialize is a responsive wordpress buddypress theme. 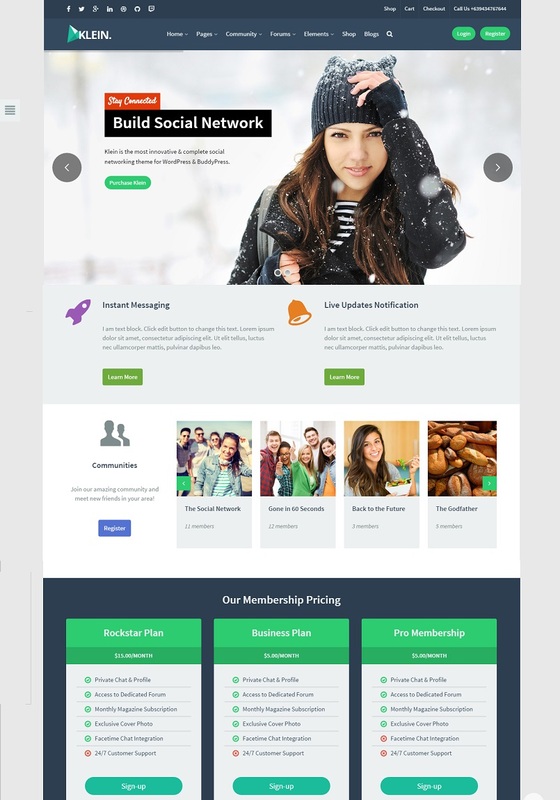 This multipurpose theme is ideal to host a community and social network. The design is modern colorful like a magazine theme. It is easy to insert buddypress widgets anywhere in the website by using visual composer plugin. The best part is Visual composer plugin is a free addon worth $34 with this theme. This plugin build amazing page layouts in just few moments. 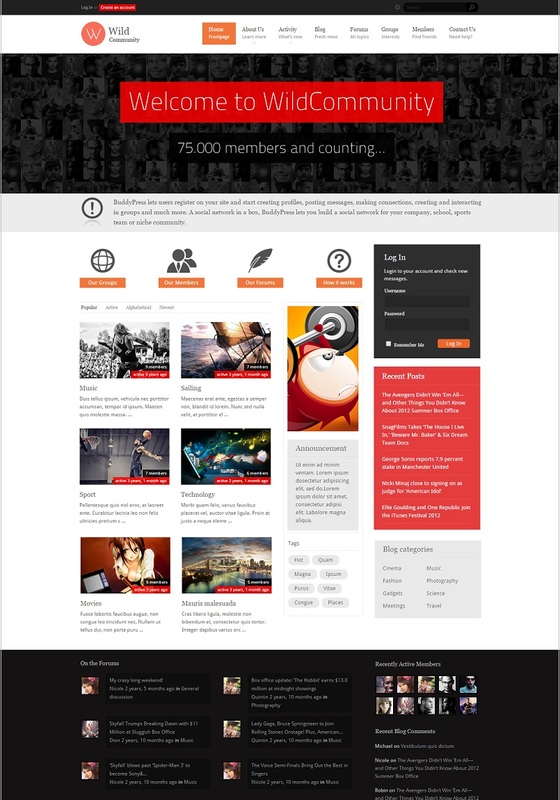 bbPress is integrated in the theme to start forums. Ajax filter allows to filter the results without reloading the page thus enhancing faster page speed. Retina ready. Events Calendar plugin is integrated. You can change colors, fonts, image for background using skins manager. The menus are customizable and powerful. Members can login via social logins – Facebook, Twitter etc. 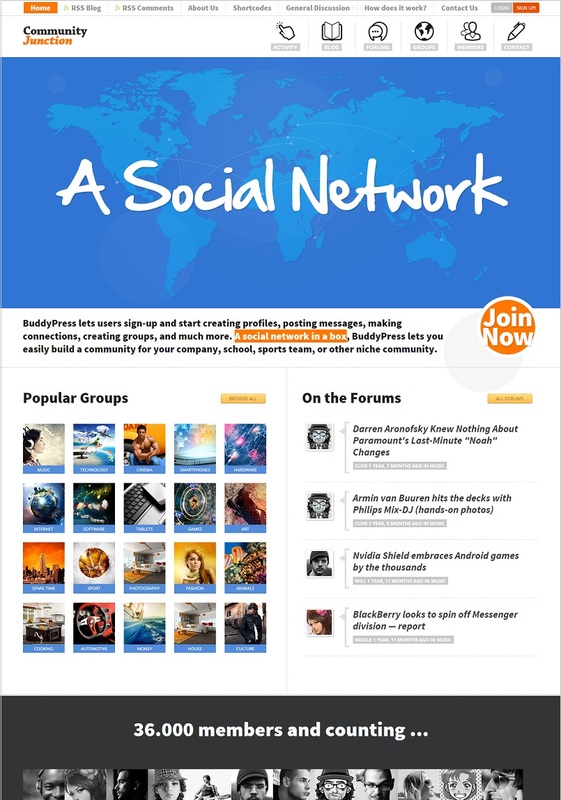 Socialize is an ad ready theme as you can insert ads at predesigned areas. Ads can be inserted in footers, headers, inside content, sidebars etc. Stick Side bar plugin worth $ 18 is another free addon with this plugin. This keeps sidebars keeps it visible always even when you scroll the page. WPML ready allows you to translate your website in any language. You can even showcase you portfolio using different display options. The theme is build using latest HTML5 and CSS3 coding. You can customize each post type. 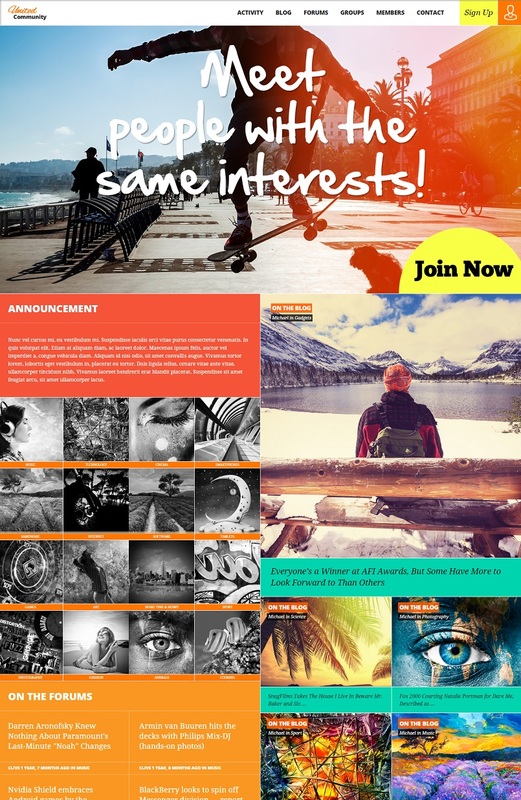 Socialize has 4 homepage layouts, 4 header choices,9 category layouts, 400 icons, 6 post layout, unlimited sidebars and much more. If we talk of community features members can create their profile, groups, post messages and plus all needed in such sites. DynamiX is a responsive multipurpose wordpress theme. The theme can be used for blogging, community website, online shop, corporate, business, forum, one page parallax site, restaurant, education and whatever work you can think of. This theme contains visual composer plugin which helps you make customized layouts and pages. The theme colors, background images, patterns and skins can be customized by using live online customizer. The theme is translation ready as it is compatible with WPML. bbPress, BuddyPress, WooCommerce are integrated in the theme. Retina ready. SEO optimized. The powerful admin options allows you to customize blog layouts, change footer, header settings and many other things. Galleries are configurable. There are plenty of options with this theme. 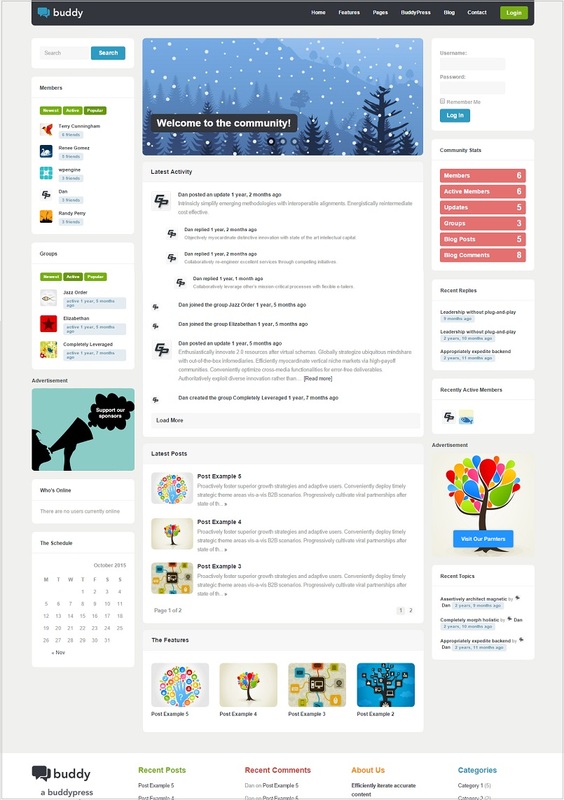 Engage is a responsive theme for setting up a community website. BuddyPress and bbPress are integrated in the theme. Vistors can signup. Features for members include are profile building, message sending, add friends, share opinion in forums, make groups and much more needed in a community website. Page templates can be customized, theme colors can changed, layered PSD’s can be customized. Theme options panels allows you to customize fonts, colors, etc. It includes useful shortcodes. This theme makes your community website in just moments. The result is beautiful clean looking website. Salutation is a responsive wordpress buddypress theme. The theme is clean and highly organized. Menus and page structures are organized making it easy for visitors to navigate. SEO optimized theme. Latest coding technique using HTML5 and CSS3 has been used to make this theme. Users can interact with each other, create profiles, send messages, add opinion in forums and lot’s more. Theme admin panel gives you the complete control to customize the theme. The theme is extremely flexible as you can use drag and drop feature to customize page and layouts. Unlimited sidebars can be generated. You the option of unlimited layouts and colors. It includes free premium plugin Slider revolution. This plugin creates awesome slide shows. Score is a responsive wordpress theme. The theme is ideal for review site of any type. GDstar rating plugin is integrated that provided advanced review system in the theme. BuddPress and bbPress is integrated in the theme. Member profiles can be created, front end logins, new registrations, groups can be formed, messages , chats etc can be conducted. SEO optimized theme. There are lot of powerful shortcodes to add buttons, images, videos etc in any page. Score is a translation ready theme which makes your website multilingual. It has 2 skin options. Advanced admin panel allows you to customize themes features. Xphoria is a responsive theme using in community websites and social network for corporate, schools, universities, fashion,sports team etc. BuddyPress and bbPress is fully integrated in the theme. There are over 40 inner pages to make your website- Members registration, login page, activity page, group activity page etc. It is compatible with over 100 buddypress extensions. Xphoria is built by using advanced HTML5 and CSS3 coding techniques. The theme is compatible across major browsers. Plenty of shortcodes. Widget ready. Translation ready as it supports WPML. The theme has a wide layout upto 1280px. Design wise it is a colorful, bold and impressive theme. All I can say is if you are looking a vibrant and modern theme then this is the right one. Basically suited for youthful visitor profile. Social Buddy is a responsive wordpress theme. This theme is great for building community websites and social networks. BuddyPress and bbPress is integrated. Block columns, color schems in homepage can easily be changed. Sliders support touch and swipe. HTML5 and CSS3 coding has been used. SEO optimized. Shortcodes are included to add buttons, alerts, tabs etc. Members can add their profiles, messages can sent, friends can added and all more needed in community website. 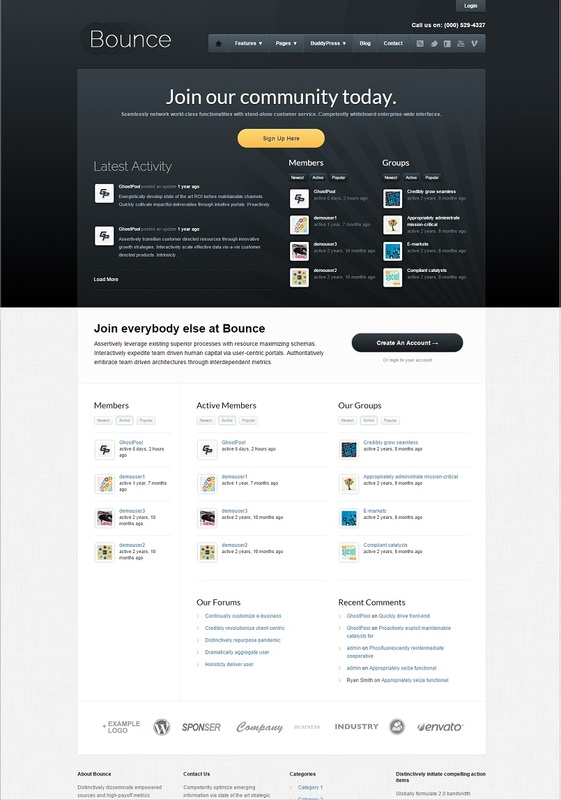 Bounce is a responsive community wordpress theme. The theme is buddypress and bbpress theme. It has 4 homepage layouts. Plenty of shortcodes are includes. Changes in shortcode in homepage creates unlimited homepage layout options. There are 7 color skins. SEO opimized theme. You can even sell products as the theme is woocommerce ready. Posts, pages and category layouts can be customized. Perfect theme to impress the site visitors. WildCommunity is perfect buddypress theme. The theme is perfect to build community and social network website for school, colleges, universities, fashion, sports, company or any other group. It is a responsive theme that fits perfectly on all screen sizes. BuddyPress & bbPress is integrated. Compatible with 100+ buddypress extensions. SEO friendly and widget ready theme. It has 4 homepage layouts, over 40 inner pages, 26 PSD files and lot’s more. Messages can be posted, groups can be made, profiles can be created and all you need in community website. 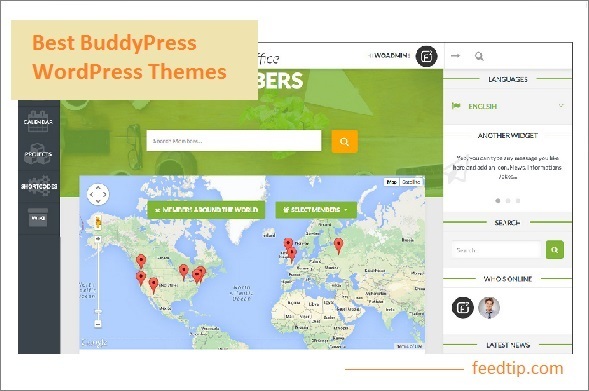 Buddy is a responsive wordpress buddypress theme. Besides being used for a community website, the theme can be used for a corporate, magazine, business, portfolio etc. The design is clean and modern. Retina ready. SEO optimized. BuddyPress & bbPress is integrated in the theme. Users can from front end , new registrations can be carried out, . Layouts can be customized. There are plenty of powerful shortcodes. Buddy is a translation ready theme. Thrive is a responsive wordpress theme. This theme can be used for company, corporate as well for intranet or extranet community websites for company or other organizations. It has plenty of features. BuddyPress and bbPress is integrated. Visual composer plugin builds amazing layouts and pages. Retina ready. It has over 600 google fonts. Events can be created using eventscalendar. Unlimited skins and colors options. Look and feel can changed using the Live Customizer. Thrive is a woocommerce ready theme which allows you to sell any product. Staff directories can be searched. Members can create activity , send messages, make friends, participate in forums, groups can added and lots more to run a community website.